Instructor User Guide ResourcesHow do I create a group folder in Resources? 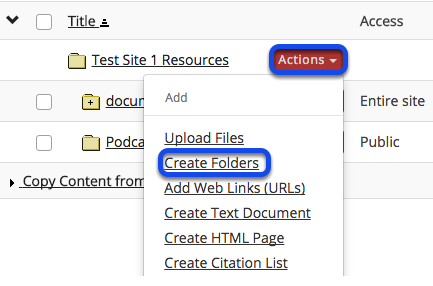 To create a group folder, to the right of the root folder, from the Add section of the Actions drop-down menu, select Create Folders. Zoom: Enter item details, then create folder. Under Availability and Access, select Display folder to selected groups, select the group name, then click Create Folders Now. Students that are not a member of the group will not have the folder displayed in their Resources. Prev: How do I make a link to a Resources folder appear in the Tool Menu? Next: How do I allow group members to upload content to a group Resources folder?